A new partnership between a paperboard mill and a biofuel producer is now producing ethanol fuel from scrap cardboard fiber. 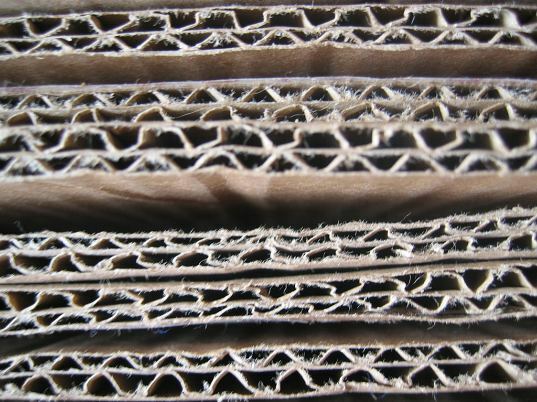 While 95% of cardboard can easily be recycled again into more cardboard, the rest is unusable and usually enters the waste stream – a loss in terms of economics and the environment. Now those leftover fibers from International Paper in Iowa are being sent off to Fiberight where they are converted into ethanol fuel. Their first batch of cardboard ethanol is almost ready and is expected to emit 80% less carbon emissions than regular gasoline. The International Paper Cedar River container board mill in Cedar Rapids, Iowa produces 1 million tons of recycled paper each year. Since 5% of that material is unusable, 50,000 tons of fiber waste have to be thrown out — but now this leftover material can be converted into ethanol fuel. Fiberight, located nearby in Blairstown, Iowa, is a fairly new biorefinery that has been converted from a corn ethanol plant. Fiberight says the residual fiber waste from International Paper provides excellent base-load feedstock for creating ethanol, and that the resulting fuel has 80% less emissions than regular gasoline. Fiberight is also planning on accepting other organic household wastes, which will be used as feedstock for what they are calling “trashanol.” This sounds like an incredibly promising technology and a win-win solution for managing waste while boosting the production of alternative fuels. We can do all the Waste you normally Landfill and make High Quality Fuel from it, cheaper, Better, Cleaner! We at Green Power Inc for now over 2 Years built and operate a Full Scale System converting all forms of Waste which have Hydro Carbons in it, so nearly everything you throw away with the exception of Metal, Glass and stones into High Quality Fossil Free Fuels. The Fuel can be straight filed into cars and engines, Airplanes etc. no modifications needed. Now you will ask why is this not all over, because of one Beaurocrat in Spokane Washington Ecology Office as he stops us all the way. Other Countries are contracting with us, but in US we are still not allowed to operate full time. We had to lay people off and are asked to move manufacturing overseas, we don’t want to but the local Government actions may force us to do so, so we would lose here in US cheap local Fuel out of waste and the Jobs as well. It feels very bad as we did not take any Government funding to build our system. Our system is ready at full scale and can be implemented anywhere in the world it can give countries fuel and energy independence out of local resources at a much lower price than regular fuel on the Market. •	We have the solution we believe check us out at http://www.facebook.com/greenpowerinc or on our website http://www.cleanenergyprojects.com. We did it without Government help and we have it working to prove our claim, on full scale not just lab scale ideas. Why spend Billions of Government funding to develop something when we already have it. Your Green Power Inc Team And Garbage we have all over the world enough to do it! A new partnership between a paperboard mill and a biofuel producer is now producing ethanol fuel from scrap cardboard fiber. While 95% of cardboard can easily be recycled again into more cardboard, the rest is unusable and usually enters the waste stream - a loss in terms of economics and the environment. Now those leftover fibers from International Paper in Iowa are being sent off to Fiberight where they are converted into ethanol fuel. Their first batch of cardboard ethanol is almost ready and is expected to emit 80% less carbon emissions than regular gasoline.